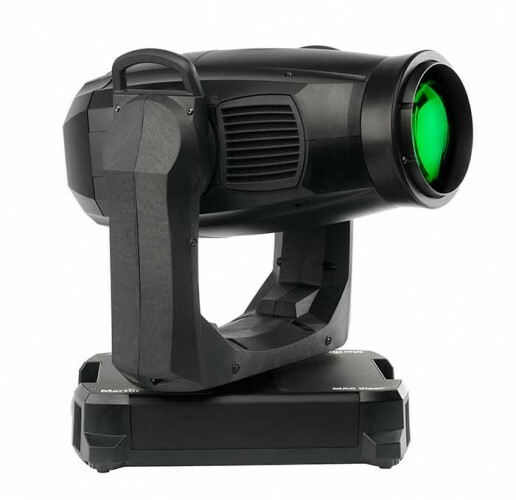 A new luminaire in Martin Professional’s award-winning MAC Viper Family of moving heads, the MAC Viper AirFX, is now shipping. Both flexible and efficient, the MAC Viper AirFX is a new concept that combines hard-edge, mid-air effects and a beautiful wash field in one luminaire. It features the same compact form, impressive speed, superior light quality and beautiful colours as the other members of the MAC Viper Family. Capable of projecting a dense, hard-edge beam with stunning mid-air aerial effects, the MAC Viper AirFX’s unique optical system allows it to adjust from a tight beam to a radiant wash instantly for greater design flexibility. The MAC Viper AirFX uses the same bright and efficient 1000-watt HID source as the other Viper Family luminaires, and at nearly 35 000 lumens of output, is brighter than larger and more power-demanding 1500-watt profile fixtures. The MAC Viper AirFX houses a selection of all-new aerial effects on two gobo wheels – a rotating gobo wheel with five replaceable designs and a fixed gobo wheel with seven replaceable designs. Hard-edge effects remain stunning and hold focus through the fixture’s entire 11 - 59° zoom range and at varying throws. Beam gobos can adjust along the entire zoom range and unlike other fixtures, light output is constant throughout the entire zoom range with no visible beam jump from tight to wide. A combination of optical design and lamp choice has been the foundation for developing a fixture rich on colours without compromising light quality. The Viper AirFX’s unique and highly efficient optical system does not boost the color temperature of the lamp and quality of white light is excellent. The CMY colour mixing system offers a superior palette including true reds, rich ambers, primary green and deep blues with added colour choice from a 7-slot colour wheel. A linear CTO provides daylight to tungsten CCT control and expansion of the CMY palette. The MAC Viper AirFX uses a special 160 mm precision PC lens for an eye-catching and distinctive fat beam look with less spill than micro-Fresnels. The beam looks brilliant in mid-air and gives a powerful visual look to any show. Beams can be further manipulated using the combined dimmer/shutter system with intensity effects for instant blackout or smooth fades all the way to blackout. Additional effects are possible from a fast and tight iris with adjustable dynamic effects as well as a frost that can snap or fade-in for beautiful wash effects. Diverse strobe effects are also possible.